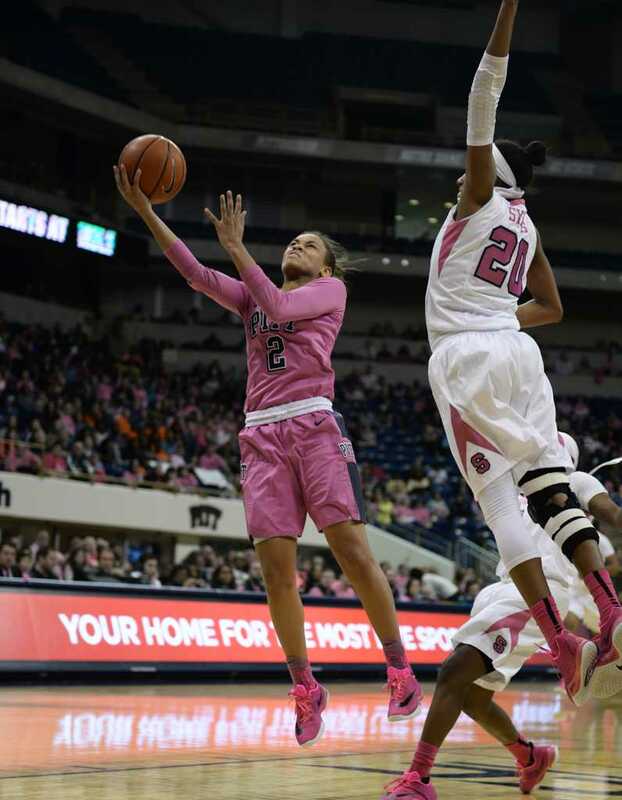 The Petersen Events Center, even decked out in pink to support the Susan G. Komen foundation, hasn’t yielded a home court advantage for the Pitt women’s basketball team this season. Pitt’s (12-14, 4-10 ACC) downfall on Sunday was consistent turnovers, leading to a defeat for the Panthers to No. 23 Syracuse (22-6, 12-3 ACC), 70-56. The loss marked Pitt’s eighth straight at-home defeat this year. Pitt fell behind early, trailing by five before sophomore point guard Aysia Bugg connected on a 3-point basket to get the Panthers on the board. After a few minutes of traded buckets, Bugg would again connect from deep to tie the game at 9-9. Syracuse added five more quick points, but Pitt used a pair of transition layups as well as a Fred Potvin 3-pointer to spark an 11-0 Pitt run, which gave the Panthers a six-point lead. The Orange would add a basket before the quarter expired, but Yacine Diop answered with her fourth layup of the quarter to keep the Pitt lead at six entering the second period. In the opening minutes of the second quarter, Pitt’s offensive formula held steady. The Panthers found easy baskets at the rim after breaking Syracuse’s full-court press and used open looks from beyond the 3-point arc to keep their lead. Despite their success from the field, the Panthers plateaued and eventually, the team’s 11 turnovers in the first half bogged the team down too far to recover. Leading by five with 4:45 remaining, Pitt yielded a 3-point basket to Syracuse’s Brianna Butler, who gave the Orange the lead two possessions later with a steal and a layup. Butler’s spark lit Syracuse’s offense to close the half on an 11-3 run, giving the Orange a three-point lead heading into halftime. Syracuse took ample advantage of Pitt’s first-half turnovers, which led to 18 of its 38 points. After rallying the team offensively in the first half, sophomore Yacine Diop again provided a jump-start in the opening minutes of the third quarter. Diop connected on her first two shots of the second half, erasing the Pitt deficit to tie the game. “I thought Yacine stepped up today. She did a lot of good things and was active and aggressive getting to the rim,” head coach Suzie McConnell-Serio said. While Diop continued to play a pivotal role in keeping Pitt in the game, fellow sophomore Stasha Carey also helped bolster the team offensively in the second half. After a quiet first half, Carey added five points in the first four minutes of the third quarter to help Pitt keep up with Syracuse. Despite erasing the deficit and taking a momentary lead, Pitt couldn’t shake its dominant issue, leading to a total of 21 turnovers. Syracuse grabbed the lead back with a pair of free throws by Brittney Sykes as well as forced turnovers on three of Pitt’s next four possessions. Syracuse carved out a 12-2 run that spanned the rest of the quarter. During the stretch, Pitt remained scoreless for more than five minutes, missing seven straight field goal attempts before a Diop layup broke the streak. In the third quarter, the Panthers turned over the ball seven times, which gained another 10 points for the Orange. “Our margin for error is slim. We need to be efficient on the offensive end,” McConnell-Serio said. In the fourth quarter, the situation became more bleak for the Panthers as Syracuse’s Butler connected on her third 3-point basket of the game on the opening possession of the quarter. Pitt kept fighting, adding a 3-pointer by Fred Potvin and a pair of layups by Bugg and Carey to bring the deficit back to single digits. “I think we had a lot of chances to get the momentum back,” Potvin said. Pitt got as close as seven points, but Syracuse continued to take the basket with ease, depleting Pitt’s momentum. The Orange held Pitt scoreless over the final 3:59 of the game and capped the scoring on a long Butler 3-pointer, earning them a 14-point victory. Bugg led Pitt offensively for the second consecutive game, finishing with 15 points. Diop also finished with 15 points and added nine rebounds, while Potvin scored 12 points on 4-7 from three. The Panthers will play next when they host Georgia Tech (16-11, 6-8 ACC) Thursday at 7 p.m.